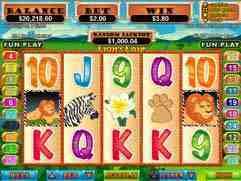 The Lion’s Lair slot machine is a jungle themed online slot machine that we proudly recommend to all of our website visitors. Lion’s Lair was developed by Real Time Gaming (RTG) and it can be found at all RTG powered online casinos. The great thing about RTG powered online casinos is that they are al USA friendly, which means that everyone can enjoy playing Lion’s Lair online from the comfort of your own home! This online slot machine features 5-reels and 20-lines of gaming action, which gives you plenty of different ways to win! One of our favorite things about the Lion’s Lair slot machine is the bonus round. The bonus round is triggered whenever three Lair symbols appear on the middle three reels. Once triggered, you are awarded 12 free spins and you get to choose your own multiplier. You are given a multiplier of 3, 4, and 5 times you bet and you must assign each multiplier to your first, second, and third set of 4-spins! This gives you some control over the game and the bonus can be retriggered, which will award you with even more free spins! The Lion's Lair Slot Machine is one of the most entertaining slot machines we've encountered and it's available to be played at the wildly popular Silver Oak Casino! In addition to the Lion's Lair Slot, you'll find plenty of other great games at this RTG powered casino; including more slots, lots of video poker, and plenty of table games! Visit the Silver Oak Casino website today to learn how you can get up to $10,000 in free casino money just for joining! Click here to play Lion's Lair at Silver Oak Casino! Head over to Slots Plus Casino today and you'll be glad you did because they are currently giving away a massive casino bonus to slot players from around the world; including the USA! For a limited time, all new slot players can get a 400% bonus worth up to $3,000 in free casino money when you make your first deposit! You can use this bonus money to play any of their great games; including the Lion's Lair Slot Machine! Take advantage of this great offer today by visiting Slots Plus Casino. Click here to play Lion's Lair at Slots Plus Casino! When you get a load of the bonus that Vegas Casino Online has to offer, you'll be scratching your head wondering if they might have let the lion loose from their Lion's Lair Slot Machine! That's because for a very limited time, they are giving ALL new players a chance to collect up to $10,000 in free casino money when they make their first deposit! This is an incredible offer and it gives you an opportunity to go a little crazy, so visit Vegas Casino Online today to get in on the action! Click here to play Lion's Lair at Vegas Casino Online! One of the best places to play the Lion’s Lair slot machine at the moment is at Manhattan Slots Casino. This RTG powered online casino is currently offering two great bonuses that you can use to play Lion’s Lair or any of their other great games. To get started, redeem the bonus code 25CBG and your account will instantly be credited with a free $30 bonus! Then, when you’re ready to make your first deposit, you can get a 400% match bonus worth up to $4,000 at Manhattan Slots Casino! Click here to play Lion's Lair at Manhattan Slots Casino! Aladdin's Gold Casino is a prestigious real money online casino that accepts virtually ALL players; including all USA players! They are powered by Real Time Gaming software and they have the complete suite of RTG casino games; including the Lion’s Lair slot machine! At the moment, when you redeem the bonus code 25CBG, you’ll get $25 in free bonus cash with no deposit required to try out Aladdin's Gold Casino! Click here to play Lion's Lair at Aladdin's Gold Casino! At the always popular Aladdin's Gold Casino, our website visitors can get two exclusive casino bonuses that you won’t find anywhere else! For starters, you can get a $25 free casino bonus with no deposit required by redeeming the bonus code 25CBG. Then, when you make your first purchase, you can get up to $8,000 in additional bonus money! These are exclusive offers and they are available for a limited time only, so take advantage of them today before it’s too late! Planet7 Casino is one of our favorite online casinos because they accept players from around the world; including all USA players. They have hundreds of great games to choose from; including slots, video poker, table games, and more! Signup at Planet7 Casino today and you can get up to $5,000 in free casino money when you make your first deposit. You can use this bonus money to play the Lion’s Lair slot machine or any of their other great games! Click here to play Lion's Lair at Planet7 Casino! If you’re in search of a reputable online casino that you know you can trust, we recommend checking out iNetBet Casino. This established and respected online casino has been in business for years and they have one of the best reputations in the online gambling industry! For a limited time only, we’ve arranged an exclusive free casino money bonus that will allow you to try out their real money casino games for free! Just redeem the bonus code CBG10 and your account will instantly be credited with $10! Click here to play Lion's Lair at iNetBet Casino! If you’re searching for a big casino bonus that you can use to play the Lion’s Lair slot machine, you’ve come to the right place! Let us introduce to you Slots Plus Casino, an established and reputable online casino that is currently running one of the biggest online casino promotions! At the moment, when you signup and make your first deposit, you can get a 400% bonus worth up to $4,000 in free casino money at Slots Plus Casino! At Aladdin’s Gold Casino, an established and respected RTG powered online casino, you can get a 200% bonus on every deposit that you make during your first seven days as a new player! That’s right; you’ll be eligible for an unlimited number of bonuses with no maximum for your first seven days as a new player at Aladdin’s Gold Casino! This is an exciting promotion that won’t last long, so take advantage of it today before it’s too late! Vegas Casino Online is one of our favorite online casinos because they offer real money casino games that you can play from the comfort of your own home. They have hundreds of great game to choose from too; including the always popular Lion’s Lair slot machine! At the moment, when you signup and make your first purchase, you can get $500 in free casino money at the one and only Vegas Casino Online! Las Vegas USA Casino is a Real Time Gaming powered online casino that has been in business for years. In fact, they are one of the oldest and most trusted online casinos around! At the moment, they are giving away up to $500 in free casino money to all new players who make a first deposit, which makes now the perfect time to get in on the action! This free bonus money will boost your bankroll, extend your playing time, and increase your chances of winning at Las Vegas USA Casino! Click here to play Lion's Lair at Las Vegas USA Casino!